Co-sponsored with the Center for Latin American and Caribbean Studies (CLACS). 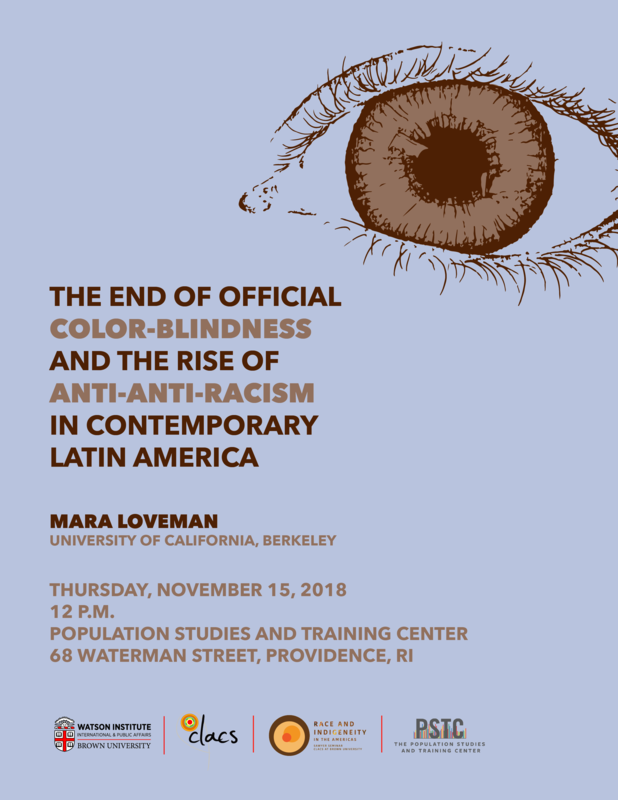 The past two decades witnessed the demise of official color-blindness across most of Latin America. This shift is clearly evident in national censuses. A few decades ago almost no Latin American countries included questions about race or ethnicity on national censuses. Today, the systematic collection of such data is the dominant practice in the region. The end of official color-blindness is also increasingly evident in the adoption of targeted social policies in many countries. Most analysts of this shift have focused on the politics of recognition that pressured states to make afro-descendent and indigenous populations officially visible in statistics and social policy. Loveman draws attention to a different reading of this trend. She shows how the politics of recognition that has demanded and achieved the official visibility of race and ethnicity in Latin America is also, simultaneously, a politics of erasure. It is a politics that has relied upon the invisibilization of some lines of delineation as a necessary and often deliberate counterpart to the official recognition of others. She argues that analyzing the politics of erasure as a constitutive part of the politics of recognition is critical to explain emergent forms of reaction against anti-racist politics in the region. Mara Loveman is Professor of Sociology and Demography at UC Berkeley. She is a political and historical sociologist whose research examines the politics of ethnoracial demography, nationalism, and the state in comparative perspective. She earned her M.A. and Ph.D. in Sociology from UCLA and her B.A. in Political Economy of Industrial Societies, Latin American Studies, and Spanish and Portuguese from UC Berkeley. Her research has appeared in American Sociological Review, American Journal of Sociology, Comparative Studies in Society and History and Hispanic American Historical Review, among other journals. She is the author of National Colors: Racial Classification and the State in Latin America (Oxford University Press, 2014).